When was the last time you saw a sore loser in a presidential race urge supporters to “resist” the new president? Cross-eyed Hillary Clinton urged her liberal supporters to stand up and resist on International Women’s Day. Hillary Clinton encouraged women to keep fighting the good fight in a Snapchat video Wednesday. The International Women’s Day message declared ‘every issue a woman’s issue,’ although Clinton directed her followers to Planned Parenthood, education health care and jobs. 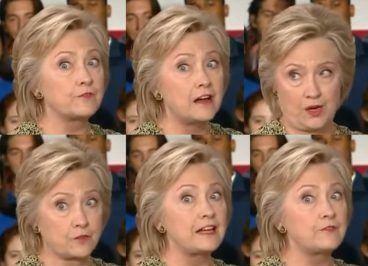 Poor Hillary – her eyes are as crooked as her politics.